I got involved with Out of the Gate via LIVE magazine in Brixton where I am the Film/TV editor which means I watch films and review them. I met Lucy Hannah who was setting up and running the project and I was really interested in it. I had previously made a radio play at South Thames College on an Access to Media course but I doubted that it would be on the same level that Lucy was talking about. 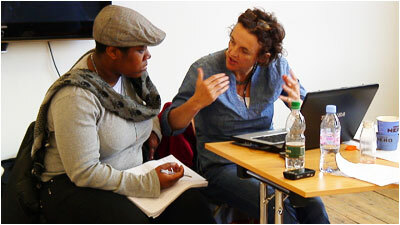 Lucy set up two weeks of workshops with a group of us from different parts of London. I was pretty excited. Week 1 was very much a preparation week. I met the other seven writers and we all seemed to gel and get on. I was the only one who’d written a radio drama before. 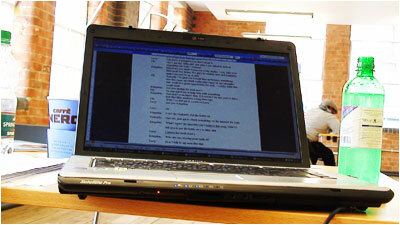 The others were new to writing scripts. We started off in groups with a basic task of finding pictures in newspapers and magazines and used them to create characters, which was surprisingly hard the first time round but after the first one I began to enjoy it. I was having so much fun naming and creating these characters and getting to know them as well as the other writers in my group. We then did this incredible thing which was to find out the characters wound, which led us to their: needs and wants. It was amazing to me just how simple these three things were, but just how layered and complex they made our characters. I was really starting to get a feel for what we were doing and I was getting attached to the characters, as were the rest of the group. All we needed now was a world to put them in. So we built a little endz for them to live and where our story could unfold. It was fun. We called their world Hamgate, which not everyone liked one hundred per cent, but now the name has grown on me. We were joined by a couple of Lucy’s friends: Al Smith, a writer from EastEnders, and Maggie Boden a script editor from a list of shows from Holby City to Dead Set. They were both surprised by all the work we had done within the week. They gave us some great advice. Week 2 we worked out the basic story and what it was going to consist of: a main character and his story (Josh) plus a secondary story (Lucy and Sarah’s friendship). When we started writing the script it was difficult. I had to figure out the point of each scene I was writing and just like our characters, our scene had to be complex and layered. We broke down our story into scenes across all five episodes. I had trouble working out how to make cliff hangers work, but by the end of the week we had scenes for each of the five episodes. We had a read through which highlighted things that needed more work and we were given notes which opened the story up. We knew things needed to be re-written, so we got straight to work and the writing just started to flow. Our group was a mixture of young ex-offenders and people like me, who have never been to prison. This helped our story because when I was writing bits for Josh about his experience and prison stuff from an emotional stand it was just nice for me to know there were people in the group who had turned their lives around, just like the point we were trying to make with Josh. They’d explain how easy it is to say you’re going to change, but the force of old friends makes it difficult and challenging. 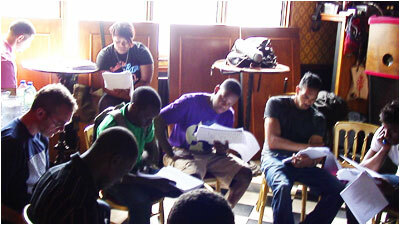 Week 3 script writing was in full swing. The group began to split between people who were more interested in writing lyrics with beats and three or four of us who were much more interested in writing scripts. People contributed scenes for each episode while Fahd Abada and I took more of an overview. We wrote and re-wrote scene after scene, which was fun but frustrating at the same time, and I can really say this was my favourite stage where I did most of my growing and learning as a writer. At last I understood how to write cliff hangers. I felt really inspired and that I was doing something well. Week 4 we started casting. I had no idea this was going to be done so professionally. Lucy had asked Melanie Harris to direct the drama (ex BBC Radio Drama and now Crosslab Productions). I didn’t know if she would get our story, but from the moment she spoke to the first actress about how to play Sarah I knew everything would be ok. I had never been to an audition. There was a table and three chairs one for the producer Lucy, another for the director Mel, and one for Chris Syrus, one of our group who’d worked with Lucy before, and she asked him to co-ordinate the music. Chris wanted to hear the Sarah’s sing and the Josh’s rap which was a requirement to get the part. We sat behind them to watch. All the wannabe Josh & Sarah’s were given one of our scenes to read. It was weird hearing your words spoken by an actress. Fahd and I realised we still had some serious re-writing to do. The casting went on for a couple of days. 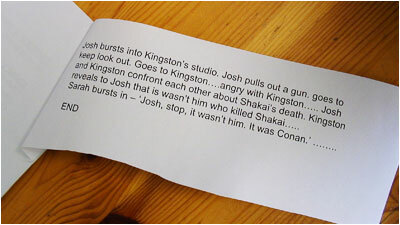 It was hard to find the right person to play Josh. In the end, the professional actors that we got were amazing and I had seen them in quite a few things. The script being finished was a scary concept because it would never really be perfect to us, but it was just a leap of faith and a big bit of letting go that would really be the best thing to do. The whole weekend I was so nervous because next week everyone would see our little scripts I would be hoping would be huge. I never thought I would have had the confidence to turn up to the read through. Week 5 we were on an actual location, a pub in Stockwell. I meet all the actors officially for the first time and we had a read through which this time I hated the script a hundred times less which was a relief given there was no more time for changes. The actors delved into the story behind the final script and asked the reasons their characters would say something, or what they were feeling. Aml Ameen (Josh), Arnold Oceng (Conan) and Nadine Wild Palmer (Lucy) were really into the story and weren’t afraid to ask the smallest question to help them find the emotion in a line. I knew the complex building of character we did in the first week would be useful in the story writing, but it was even more so for the actors. The recording was nothing like I had expected – we had a proper schedule, Carl, one of our group logged all the takes, and a three of us had parts. My mum played Josh’s mum, and everything had to be done in a certain time, but it wasn’t so planned that we didn’t have any fun. My favourite part of the recording stage was watching the recording of my favourite scenes and even the ones I had the most difficulty writing come to life but most of all watching my duet as an actress. Lucy interviewed me about the process. I felt a bit nervous and it made me sad because I felt it was all coming to an end. The music was recorded in a studio in a studio. I was mainly part of the script writing team, but I wish I’d taken more of a role in the lyric writing group. The recording in the studio was so much fun. Nadine Wild Palmer (Lucy) was an excellent singer and she helped out with some of the songs which was nice of her and we were lucky to have her around. Week 6-8 the drama was edited by Alisdair McGregor with Lucy. Alisdair is a sound engineer – he also recorded the drama on location. We listened back to sections of it on CDs and gave our feedback. The opening scene was so powerful. I thought right back to when Lucy ask me to re-order the first episode. That whole day I kept thinking this is so confusing, but hearing it back I realise it really works. It was weird listening to it for the first time, but we continued to see how it kept changing and developing. We set about writing content for the website. After our meeting with the designer, George Owens, and talking to illustrator Jelani Dacosta-Best we all felt having cartoon characters as the faces of our Hamgate residence was a cool idea. I hope on so many levels that I get the opportunity to do this again. It’s been the experience of a life time and I’m so grateful to have had the chance to take part. I hope Out of the Gate has another season, so I can expand on the skills I have developed already and make this into a career.